I had the privilege and pleasure of knowing George Malcolm for over 30 years, having first met him at the Spode House Easter Music Week in 1966. I was then a young student at the Royal Academy of Music and was thrilled to meet the dedicatee of Benjamin Britten’s brilliant Missa Brevis, the piece that, when I first heard it as a schoolboy, spurred me to try my own hand at composition. I had no idea that George would become an inspirational mentor and the most generous and loyal of friends. Through him I would meet many eminent musicians and was introduced to the vibrant musical life of London and festivals like Aldeburgh, Dartington and Bath. 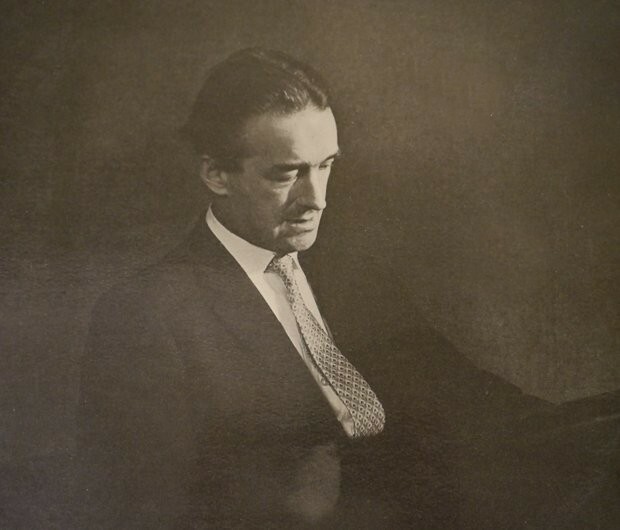 With the help and support of George’s executor, Christopher Hirons, I’ve put together a website in memory of this great musician [who was a pianist, harpsichordist, organist, choirmaster, orchestral conductor and composer]. The site includes much fascinating archive material, reviews, interviews, pictures, anecdotes and reminiscences, as well as many audio and video clips. George’s musical talent was spotted very early, and after 18 months of piano lessons with a gifted nun in the kindergarten, he started to study with Kathleen McWhitty [actually Kathleen McQuitty, see comment below] at the Royal College of Music, aged seven [and remained the only child there for several years]. Following Oxford University, he returned to the RCM and studied with Herbert Fryer, intending to become a pianist. The War drastically changed the direction of Malcolm’s life, and he was appointed a RAF bandleader, organising and conducting concerts all over the country. On being demobbed he planned to resume his career. Taken with the idea of owning an antique instrument, for his own pleasure at home, he bought his first harpsichord at an auction [in 1946], with his demob gratuity. Such an instrument was rare then, and very soon they were both in great demand. Here they are playing Vivaldi together, in a video of a recording session, made in their very early days. Throughout his life George Malcolm championed the harpsichord through concerts and recordings, mostly drawing on the large 18th-century keyboard repertoire. He was also a fine exponent of more recent works and made some brilliant arrangements himself. Here’s Malcolm playing his own Bach Before the Mast, a whimsical fugue on the well-known Sailor’s Hornpipe, which he wrote in the style of J. S. Bach. George was appointed Director of Music at Westminster Cathedral in 1949. He had a deep affinity with Catholic church music, and achieved great success in producing the bright “continental” sound that so impressed Britten when he wrote his Missa Brevis especially for the Cathedral Choir. By 1959 ever-increasing demands for concert performances caused Malcolm to resign his post at the cathedral and become conductor of the Philomusica of London [Thurston Dart’s old band] as well as associate conductor of the BBC Scottish Orchestra. George Malcolm was a great musician, a Renaissance man, a wonderful human being. He has been inﬂuential in the development of choral and instrumental music in Britain and abroad, and l consider myself one of the fortunate recipients of his immense knowledge, broad culture, and excellent taste. He should never be forgotten. Here they are together, with the English Chamber Orchestra in Mozart’s Piano Concerto No. 19, which was to be Malcolm’s last public performance. Mr Lord would welcome any further information about George Malcolm, and can be contacted through the website. David Hansell has prepared a score and parts, from the autograph manuscript, of George Malcolm’s brilliant pastiche “Variations on a Theme of Mozart” for four harpsichords (or pianos), which he wrote for Thom Goff’s annual harpsichord jamboree at the Royal Festival Hall. David, and the copyright holder Christopher Hirons, have generously made this material freely available here for download and performance. With the centenary of George’s birth coming up in 2017, it is hoped that we may get a performance or two, though the logistics of getting four harpsichords together are perhaps somewhat daunting! My grandmother was Kathleen McQuitty who taught George Malcolm the piano at the RCM from age 7-19. She was an FRCM (married to the organist Henry Wilson, also an FRCM) and the first cousin of the photographer/film producer Billy McQuitty. Her surname has been incorrectly spelt on a number of articles on the Internet. I have this information from my mother, Mary Woolmer nee Wilson.